He's Bomberman... to the MAX! I've played several Bomberman games before, but I've never had to review one until now. To be honest, I don't really know quite what to say at this point. To me, every Bomberman game seems different. Therefore, I am going to treat this game as a single game and try not to compare it to the other Bomberman games I'm familiar with. 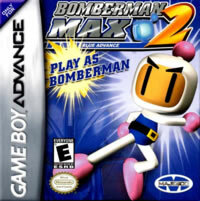 Bomberman Max 2: Blue Advance was released alongside its "sister game" Bomberman Max 2: Red Advance. The only difference (from what I've seen and read) between the two games is that in Blue Advance you play as Bomberman, and in Red Advance you play as Max, a relatively new character who was introduced in the previous games of Bomberman Max for Game Boy Color. The story goes that villain Mujoe (who looks suspiciously like a cartoon version of Hulk Hogan) has shrunk down both Bomberman and Max to the size of mere insects. This would make most people cower in fear, but to Bomberman, this is only a new trail to blaze...literally. 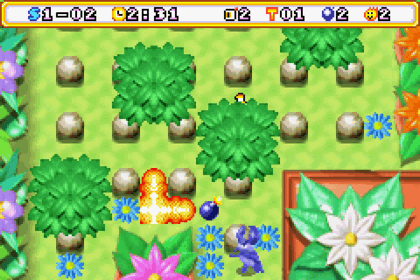 Bomberman makes his way through four small-themed worlds—Garden, Library, Kitchen, and Toy Room—before making his way to the final bosses of the game. All the while, Bomberman has been collecting various Charabom (the Bomberman universe's version of Pokémon) and raising them into powerful creatures that each have a unique ability and all are ride-able! These creatures will definitely come in handy, so grab up as many as you can! I found that the artwork in this Bomberman game was quite charming. The colors are bright and cheerful. The enemies and explodable blocks are easy to pick out. However, the artwork didn't seem quite polished in some places. A few enemies seemed kind of washed out and blurry. In fact, quite a few things seemed rather blurry, including your sweet Charabom rides. Normally, this really wouldn't be an issue, but seeing as some of the game layers are sharp and some are blurry, it can be a little "blah" to look at. However, the artwork isn't a major point when it comes to giving the game the score that I see fit. Looks like classic cute Bomberman! The gameplay is exactly what you'd expect from a Bomberman game. 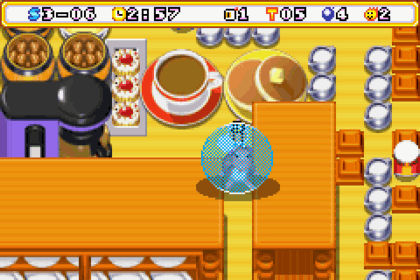 Bomberman goes around blowing up blocks and enemies in order to get to the goal of the levels. These goals range anywhere from "collect a Charabom" to "blow up all the explodable tiles" to "defeat all enemies within a certain time limit". I actually liked the various goals of these levels...except for one goal. The "defeat all enemies except for this certain enemy" really gave me a hard time each time I came across it. Most of the time, the enemies that the level would have you avoiding were ones that would chase you down mercilessly or would conveniently hop right into the path of your bombs. Once you hit one, the level's done and you have to start all over again. It's quite frustrating, to be honest. Otherwise, the levels are simple, but complicated enough to add just enough difficulty to make the game fun. Speaking of difficulty, aside from my frustration in running circles around "Mouseys", something else seemed a bit off to me. Was it just me, or were the first few bosses really easy? Maybe it was just beginner's luck, but the bosses seemed to move rather slowly and predictably. I normally finished them in one try even though several levels took me numerous times. Maybe the developers were trying to balance the difficulties between the levels and the bosses? I doubt that. Bosses are supposed to be challenging! The levels are supposed to gradually increase in difficulty and then the coup de grace was the boss that would take you hours and hours to beat and give you that sense of accomplishment. The only accomplishment I felt was when I finished that one level without blazing one of those gosh-darned jumping worms! Overall, it seems like I'm fairly negative towards this game, but ultimately all of these components came together to give me quite a good time. I wouldn't say this is the best Bomberman game ever, but it is pretty fun. I would recommend it to my fellow Bomberman enthusiasts with the phrase "Good luck." You might need it. You might not. You don't know until you play it!